These days, a business organization can’t think of making rapid progress without having an online presence. It doesn’t matter how large your company is, potential customers will face difficulties to contact you. So, the time has changed a lot. Companies have started to go online with the WordPress CMS. Indeed, WordPress is one of the most popular and easy-to-use CMS platforms for creating business websites. One needs to choose a suitable theme to create an amazing business website & make it popular among the audience. There are multiple business themes available on different online resources. All of them differ with each other when it comes to quality, availability of useful features and settings for easy site administration. So, what are your options when you have to create a professional business website? 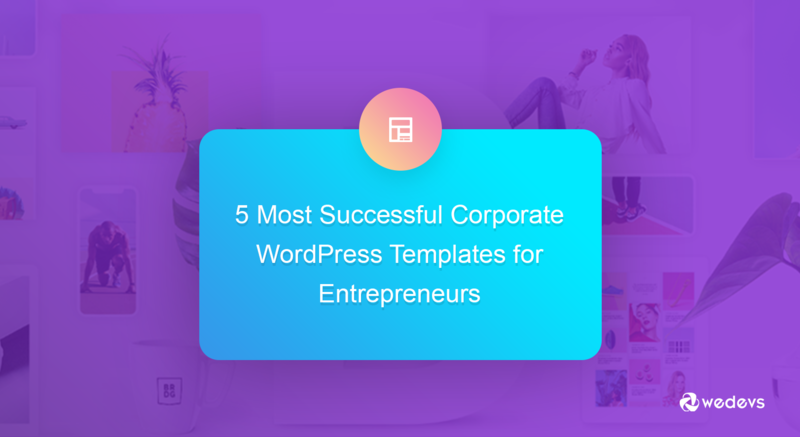 Well, we have reviewed several WordPress business themes and picked up the top 5 for you. Let’s see them & choose yourself. This template includes video tutorials that contain step-by-step instructions for installing and updating themes and content (video, audio, galleries). The theme allows you to import any versions with a single click and receive a fully equipped website within a few minutes. You must know that It differs in a collection of visual effects, ranging from a slider, pop-up text, gradual fading, and ending effects for graphics and text (size, color, fonts, three-dimensional text, shadow, overlay on video, etc.). The contact form and Google maps are fully customizable, which gives WordPress developers & WordPress development agencies the ability to create an online store using the WooCommerce' e-commerce plugin. Useful features, such as counters, pie charts fully satisfy the requirements for a business website. Shapely is an ideal template for creating a WordPress website with responsive design in an easy way. The main page is designed as a one-page with perfect design and excellent functionality. It is perhaps the best free WordPress template with a lot of settings. Shapely contains several built-in widgets for the main page that you can use to add portfolios, reviews, parallax sections, information about your product or service, a call to action, and more. It supports most of the free WordPress plugins, such as WooCommerce, Jetpack, Gravity Forms, Contact Form 7, Yoast SEO, Google Analytics from Yoast, etc. So, you can use it to create all types of WordPress websites without having any second thought in mind. Newspaper X is a simple WordPress magazine template for creating different types of websites, such as fashion, technology, food, lifestyle, new cars, games, and many others. You can use it for private or commercial use without any restrictions. It is fully responsive and will look great on both large monitors and mobile devices. It is easy to customize using the built-in WordPress Customizer. You can publish in four sections. For example- editorial, events, latest news, and world news. This rule is not applied on blog pages, where you can create as many headings as you like. NewsMag Lite is a powerful and impressive WordPress template. It is responsive to all mobile devices and easy-to-use. It has four different blog page styles. This theme has been recently redesigned and expanded greatly. It is well customized for search engines (SEO). The template makes use of Bootstrap 3, Microformats and Font Awesome icons. It offers a wide collection of tools and premium features which allows you to achieve incredible levels of customization without writing a single line of code and get professional results easily and effortlessly. For instance, you can easily add a contact form and a Google map, custom colors, Google fonts, dynamic widgets, a slider (responsive and mobile touch), a widget of popular messages, etc. If needed, you can also create a custom homepage to use three different block styles, banner and slider unlimited. The theme offers a widget sidebar and four columns Footer Widgets. You can add an unlimited number of widgets to each column of the sidebar and footer if needed. It is accompanied by a comprehensive installation guide and settings, making it easier for web developers to use the theme and create outstanding websites. Sparkling is the most popular WordPress template, used by thousands of entrepreneurs and companies all around the world. It is a clean theme developed on Bootstrap 3. It’s a flat design template with perfect design, great functionality, and flexibility. It supports more than 20 different languages and is compatible with the WPML plugin for creating multilingual websites. In recent times, the Sparkling template has seen several important updates to keep up with trends in web development and web design. This is the perfect WordPress template for personal and corporate websites for healthcare, fitness, education, finance, business, travel, web design, marketing or any other niche. The Sparkling template is SEO friendly. The template supports most free and premium plug-ins, such as weForms, WordPress user frontend, Gravity Forms, Contact Form 7, SEO from Yoast, W3 Total Cache, etc. It can also be used to create WooCommerce websites through integration with WooCommerce. Want to build your own e-commerce marketplace using WordPress? Check out how Irish teacher creates a revolutionary resource hub using WooCommerce and Dokan. Entrepreneurs need to select good business themes to create amazing business websites with the WordPress CMS. You can choose any theme from these. These themes are packed with lots of features and functionalities, which allows you to build high-performing, unique & eye-catching Business Websites in an easy. Best of Luck! This post is written by Jason Daszkewicz. He is a Senior WordPress developer and passionate blogger. Currently, he is associated with WordSuccor–WordPress theme development company in the USA. He is well known for his professional writings and technical blogs. Follow him on Twitter.